The "Pantanal" (swamplands) of Mato Grosso, with an extension of 250 thousand km2, is the largest flooding area in the world. 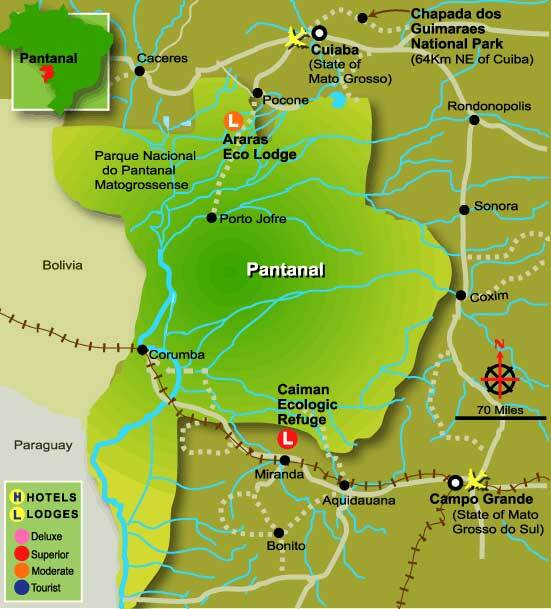 The "Pantanal" is an enormous intercontinental bay, delimited by the Brazilian Highlands to the east, the Mato Grosso Plains to the north, and also by a chain of hills and highlands on the bottom of the Andes, to the west. Therefore it might be considered a large internal delta, where the waters of the higher Paraguay River, and a large number of rivers that descend from the Highlands, accumulate. The "Pantanal" is closely linked to the large basin of the Paraná and Prata rivers via the Paraguay River. Difused aquatic connections with Amazonian tributaries exist, however, to the north of "Pantanal", especially with the Guaporé river. The drainage of this internal delta by the middle Paraguay, via the narrow and shallow strip of Fecho dos Morros do Sul, is done with great difficulty. However, enormous quantities of stagnated water behind this barrier make the "Pantanal" into an umpredictable labyrinth of still and running waters, temporary or permanent, designated by a large quantity of specific terms by the men of the "Pantanal". In the indigenous legends and in the first maps, the "Pantanal" is remembered as a great lake full of islands, the "sea of the Xaraiés". In rainy years, as in 1984 and 1995, the Paraguay river expands itself in a strip of up to 20 km wide, invading the great lakes on the Bolivian frontier and the Caracará Island, temporarily regenerating the "sea of the Xaraiés" of the old rainy climates. The Paraguay and other swamp rivers have small declivity, in the order of 20-30 cm per kilometre, which causes the waters that accumulate during the intense rainfalls to drain away very slowly. Consequently, the floods, which are at a maximum in the north during the months of March and April, arrive in the south of "Pantanal" only in July and August. Meanwhile, large quantities of water, probably hundreds of cubic kilometres a year, are lost through direct evaporation into the atmosphere. The "Pantanal" can be considered, with justice, the largest "window" of fresh water evaporation in the world. The whole life and economy of the "Pantanal" are related to this inundation system. The region is an interesting aquatic paradox in an area of semi-arid continental climate, or arid even. Without the abundant and shallow subterranean water table and the alluvions left by the floods, the terrestrial vegetation would be similar to that of the "cerrado" or the Bolivian "Chaco". Equally, the rich fauna of birds and mammals depends, in the great majority, on aquatic food. The "Pantanal" might be seen then as a large and dynamic interface between the aquatic and terrestrial worlds. The aquatic vegetation is fundamental to "Pantanal's" life. The floating plants are the major primary producers in the waters of "Pantanal". Huge areas are covered by "batume", floating plants such as the "agapé" (Eichhornia) and the Salvinia amongst others. Taken by the rivers, these plants form real floating islands, the "camalotes". After the inundations, the layer of nutritious mud allows the development of a rich herbal vegetation. The "carandá" palm tree (Copernicia australis) occurs in extensive formations in areas where the floods are predominant but which remain dry during the winter, permeating with the termiteries where the "paratudal" (shrubery) starts. The "paratudais", formed by the purple "ipês" (Tabebuia, locally called "piúva"), are typical. In a region a little more elevated, already in flooding areas, there is a typical vegetation of "cerrado". There are also, in the "Pantanal", areas of dense and shady woods (with Piptadenia, Bombax, Magonia, Guazuma). Around the highest riverbanks the "acuri" palm tree (Attalea principes) appears, forming a forest of galleries together with other trees, such as the "pau-de-novato" (Triplaris formicosa), the "embaúba" (Cecropia), the "genipapo" (Genipa) and the fig trees (Ficus). In high points of the hills there is a vegetation similar to the caatinga (a dry bush), with the bromeliaceae Dycia and the cactus "cansação" and "mandacaru" (Cereus). The geological past has permitted the "Pantanal" to constitute the largest junction of exchanges between the aquatic flora and fauna of South America. Nowadays it is populated by a variety of Amazonian and southern organisms. Being mainly a corridor of exchanges, it doesn't house as rich an endemic fauna as the Amazon, and it is the quantities, not the qualities that characterise it. The "Pantanal" offers to the visitor a great variety of open landscapes inhabited by large animal populations, whose feeding depends on the aquatic phase. This way, in the lakes, the microflora and microfauna allow the developement of rich populations of "arua" snails (Brazilian anphibious molusc, Pomacea, Marisa and others) and shells (Anodontides, Castalia and others), which sustain a variety of predators of these moluscs, such as birds and reptiles. The innumerable shoals of "pitu" (Macrobrachium) and the various species of crabs (Trichodactylus, Dilocarcinus and others) have indirect economic importance: they serve as bait for the fishermen. The abundant fish include the "corumbatá", "pacú", "cascudo" (cat fish), "pintado" (surubim), "dourado" (dorado), "jaú" (cat fish) and piranhas. Among the aquatic vegetation eaters, there are large populations of capybaras (Hydrochaeris, hydrochaeris) and buffalos. The "cágado" (a fresh water chelonian; Platemys) is also vegetarian. The "ariranha" (Pteronura brasiliensis), important piscivorous predator, formerly abundant, has been almost exterminated by the hunters. The "jacare" (Caiman crocodilus yacare) might have a similar destiny, decimated by the illegal hunting of the last few years. The alligators have an important role in the waters of "Pantanal", functioning as predators "regulators" of the fauna of fish, and sometimes as relevant agents of the nutrients cyclosis. Where there are many alligators, few piranhas are found. Another important aquatic and semi-terrestrial predator is the "sucuri" (anaconda; Eunectes notaeus), unfairly pursued by the "Pantanal" man. Snakes are rare in the "Pantanal", especially in the flooding areas. Although there are water snakes (Liophis, Helicops), "jararacas" (Bothrops neuwidii) and "boipevaçu" (Hydrodynaste gigas). The Pantanal birds are one of "Pantanal's" main attractions. Joined in huge concentrations, they explore aquatic food resources. The "tuiuiú" (Jabiru mycteriaI), the "cabeça seca" (Mycteria americana) and the "coleteiro" (Ajaia ajaja), besides "biguás" (cormorants) herons and ducks, are the most eyes catching. Many species nest in common areas, on determined trees, known as "ninhais" (groups of nests), which stand out in the "Pantanal" landscape. An admirable spectacle is to follow the birds, at nightfall or at dawn, to their dormitories on the riverside where they spend the nights. Typical "Pantanal" birds include the "aracuã do Pantanal" (large tailed squirrel cuckoo; Ortalis carnicollis), the blue macaw (Anodorhyncus hyacinthinus), risking extinction, and the black headed parakeet (Nandayes nenday). The small cardinal bird (Paroaria capitata) is a characteristic bird of this ecosystem. A large abundance of birds of prey, especially the "caracará" (Polyborus) reflects the richness of animal preys. The "caramujeiro" hawk (Rosthramus sociabilis) feeds on molluscs. Typical cerrado animals are also found in great number in the "Pantanal", attracted by the abundance of food in the flooded areas. These are species, which appear sparsely in other areas of the continent. The "pantanal" deer (Blastocerus dichotomus), common in the rich humid pastures, may be seen alongside two other species of "cerrado" deer and other mammals, such as the "cachorro-vinagre" (Speothus vinaticus), the tapir (Tapirus terrestris), the "caitetu" (peccary; Tayassu tajacu) and the agouti (Agouti paca). There is also the "guará" wolf (chrysocyon brachyurus) and the "tamanduá bandeira" (great ant-eater; Myrnecophaga tridactyla), which are hunted intensely. Among the primates, the "macaco prego" (capuchin monkey; Cebus apella) can be found there, alongside the "bugio" (Alouatta caraya). Montane pigs, descendants of domesticated swine, also proliferate amongst the dense "Pantanal" vegetation. Like the jaguar (Panthera onca), many other felines are attracted by the abundance of prey. The predator on the high riverbanks is the spotted jaguar, together with other felines and canines. Among the birds, the emu (Rhea americana) and the "siriema" (crested cariama; Cariama cristata) are typical inhabitants of the "cerrado". Naturally, the rich fauna offers many opportunities to birds of prey and carcass eaters. The open landscapes of the “Pantanal” facilitate the census done by air of the populations of large vertebrates. It is estimated, for example, that there are today 10 million alligators, 600 thousand capybaras and only 35 thousand pantanal deers. The water level difference between the dry and rainy seasons is, on average, only four metres, but due to the small declivity, the majority of "Pantanal" might be flooded. In years of high rainfall, the waters surpass the six-metre level. On these occasions, the water of rivers such as the Paraguay, Cuiabá, São Lourenço, Taquari and Miranda, as well as their tributaries, overflow and innundate enormous areas. These form a dense network of lakes, bays and flooded lowlands, interconnected by perennial - the "corixos" - or ephemeral watercourses. Only high terrains, called "cordilheiras" (mountain chains), a few islands and higher areas escape innundation. Some isolated hills of pre-Cambrian rocks, the "inselbergs", stand out in the swamps. The Morro do Azeite is one of these hills, on the banks of the Miranda river. When the waters return to normal, many bays and lakes remain, whilst others dry. Rich herbal vegetation spreads through the lowlands, taking advantage of the nutritious mud left by the flood. There are also small bays of salt water. At each precipitation / evaporation cycle the mineral salts accumulate, resulting in a certain salting of the soils and some bays. The salt concentration in these bays, in places like the Nhecolandia region, might be near to marine concentrations. "Pantanal's" fauna of aquatic birds and paludicolous (inhabitants of lagoons) is among the world's richest, with many species of ducks which filter small animals and algae, the "irerê" being the most common and abundant in the region. Some of the ducks belong to the typical fauna of the Paraná - Prata system. The "tach ã", or "Pantanal's guard", an animal peculiar to South America and a distant relative of the Anatideos, can easily be seen on the grass fields or perched on tree tops where they remain for hours. Many species of herons and "socós" form large colonies in the trees of riverbank woods. The largest of our heron species is the "maguari". Although of solitary habits, it is common to find groups of large white herons together with small white heron groups. Each is specialised in the hunting of various preys, like fish, amphibians and small reptiles, in different zones of the lagoons, during the day or at sunset. The Ajaia ajaja, the beautiful pink "colhereiro" is a specialised filtration bird. The stork, the "cabeça-seca" and the "tuiuiú" feed on insects, crabs, snails, frogs and fish, which they collect, from shallow waters and mud. The "tuiuiú" is one of "Pantanal's" symbols. Its isolated tree nests stand out in "Pantanal's" landscape. This varied group of aquatic birds has different diets and hunting strategies. The "biguá", for example, catches fish by swimming and diving; the "biguatinga", with its serpent like neck, uses the pointy beak to spear the fish. The "caramujeiro" hawk is a "specialist" in catching snails, and thus dependent on the gastropodous existence, especially the "aruás".